Through perpetual [Eucharistic] adoration Jesus longs to open up the floodgates of His merciful love on a troubled world. He longs to heal a broken humanity. Otherwise, He continues to weep in spirit and say: "O Jerusalem, Jerusalem, you slay the prophets and stone those who are sent to you! How often have I wanted to gather your children together as a mother bird collects her young under her wings, and you refused me! Your temple will be abandoned I say to you, you shall not see me until the time comes when you say, 'Blessed is He who comes in the name of the Lord'" (Luke 13:34-36). - from "Worthy Is the Lamb"
Jesus is condemned by His own people, by the very ones He showered with His favors. He is condemned as a fomenter of rebellion, He Who is goodness itself; as a blasphemer, He Who is holiness itself; as one seeking power, He Who made Himself the least of all. He is condemned to die on the Cross like the lowest of slaves. Jesus is more cruelly treated by bad Christians than by the Jews. In Jerusalem He was condemned only once, but in the Blessed Sacrament, He is condemned everyday and in thousands of places, and by an appalling number of unjust judges. O Jesus, forgive, I beseech Thee, all sacrileges! Should I ever have committed any, I want to pass my life making reparation for them and loving and honoring Thee for them that despise Thee. Grant me the grace to die with Thee! For three months the Blessed Virgin guarded her secret alone. No one but her knew that she bore her God within her womb. But when Saint Joseph learned of it from the angel, his faith acquiesced at once in blind submission. For six months he poured forth his soul in sublime adoration to God Who dwelt within Mary. Words cannot express the perfection of his adoration. If Saint John leaped in the womb at the approach of Mary, what feeling must have coursed through Joseph during those six months when he had at his side and under his very eyes the hidden God! If the father of Origen used to kiss his child during the night and adore the Holy Spirit living within him, can we doubt that Joseph must often have adored Jesus hidden in the pure tabernacle of Mary? 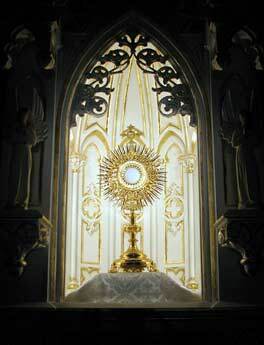 How fervent that adoration must have been: My Lord and my God behold your servant! No one can describe the adoration of this noble soul. He saw nothing, yet he believed; his faith had to pierce the virginal veil of Mary. So likewise with you! Under the veil of the Sacred Species your faith must see our Lord. Ask Saint Joseph for his lively, constant faith. When later he carried the Child in his arms, acts of loving faith welled up constantly in his heart. It was a worship that pleased our Lord more than that which he receives in heaven. Picture to yourself Saint Joseph, adoring the little Child in his arms as his God. He tells of his readiness to die for Christ, of all his plans to promote Christs glory, and to win more souls to his love. No lover builds more scintillating plans for his loved one than a saint. The purer and simpler a soul, the more magnificent its love and adoration. Adore the Word present on the altar, born as a little Child for you; no matter what you do, your adoration will never equal in worth that of Saint Joseph. Join with his merits. A soul that loves God offers everything to Him in love and God listens to such a soul, for she is worth a thousand others. humble can eat the Lord." "Adorers are among those towards whom Saint Joseph tends to be partial. They can count on him first of all because they are seeking a master who will teach them how to offer worship to God and share his function of helper of the Universal Church as they kneel before the Blessed Sacrament. Then there are points of similarity between the lowly and hidden life of Christ with Mary and Joseph and the mode of being Christ assumes in the Eucharist. When living in Nazareth, 'though he was divine (Christ) did not cling to his equality with God' (Ph. 2:6) but appeared like other human beings without glory to which he was entitled and the power inherent of his divinity." "Here in the Eucharist His very humanity is concealed. 'Truly God is hidden with you, the God of Israel, the saviour' (Is 45:15). Adorers can remain hours before the Blessed Sacrament or as happens in many centres return in relays to maintain the perpetuity of adoration. All they see is the appearance of bread, a substance that has ceased to exist. What a difference between the inertness of the Host and the infinite power compressed as it were in the invisible reality of Christ's Body! To Saint Joseph the lowliness of the Species is a reminder of a hidden life which he shared with Jesus and Mary. And it is because adorers have so much in common with him that he feels impelled to make their aspirations and difficulties his own,"
"More than this. Because our function as adorers is so reminiscent of his lifework and mission, he recognizes in us a potential which he does not hesitate to seize upon: just as he was the incarnation of the Father's love of the Incarnate Word, so does he count on us to incarnate his own love of and his complete dedication to the same Christ present in the Eucharist. We thus prolong Saint Joseph's presence on earth by reproducing his sentiments. Like Saint Peter Julian the adorer can look upon himself as the 'Joseph of the Eucharist.'" "My Lord Jesus Christ, who, for the love You bear to mankind, do remain night and day in this Sacrament, full of pity and love, awaiting, calling, and receiving all who come to visit You; I believe that You are present in the Sacrament of the Altar; I adore You from the depths of my own nothingness; I thank You for the many graces You have given me, and especially for having given me Yourself in this Sacrament...,"
"Without [these] lights and [this] little throne our Lord cannot come out of His tabernacle. We give them to Him, and we say to Him: 'Thou are on a beautiful throne. It is we that have erected it for Thee. It is we that have opened the door of Thy prison and rent the cloud that hid Thee, O Sun of Love. Dart Thy rays now on every heart,'"
"Blessed be Thou, my Lord Jesus Christ, who didst foretell Thy death before the time, and in the Last Supper didst wonderfully consecrate Thy precious Body of material bread, and also charitably gave it to Thy Apostles, in memory of Thy most worthy Passion,"
"Just as the divine Redeemer, dying on the Cross, offered Himself as Head of the whole human race to the eternal Father, so also in this "clean oblation" (Mal 1:2), He, as Head of the Church, offers not only Himself but, in Himself, all His mystical members." "In this manner [Eucharistic adoration] the faithful testify to and solemnly make evident the Faith of the Church according to which the Word of God and the Son of the Virgin Mary who suffered on the Cross, who lies present hidden in the Eucharist, and who reigns in heaven are believed to be identical." If the Word of God is living and powerful, and if the Lord does all things whatsoever he wills; if he said, "Let there be light", and it happened; if he said, "let there be a firmament", and it happened; ...if finally the Word of God himself willingly became man and made flesh for himself out of the most pure and undefiled blood of the holy and ever Virgin, why should he not be capable of making bread his Body and wine and water his Blood?... God said, "This is my Body", and "This is my Blood." "O outstanding miracle! O marvelous and most divine Sacrament!... What the priest takes up is not what he replaces on the altar. That which is taken up and placed down seems to be the same in appearance, colors and taste. Completely different, however, is that which appears from that which lies within. Common bread is lifted up from the altar; the immortal Flesh of Christ is set down upon it. What was natural food has become spiritual food. What was the momentary refreshment of man has been made the eternal and unfailing nourishment of angels,"
O God, Who hast given us a royal priesthood, we beseech Thee, that as Blessed Joseph was found worthy to touch with his hands, and to bear in his arms, Thine only begotten Son, born of the Virgin Mary, so may we be fit, by cleanness of heart and blamelessness of life, to minister at Thy holy altar; may we, this day, with reverent devotion partake of the Sacred Body and Blood of Thine only begotten Son, and may we in the world to come be accounted worthy of receiving an everlasting reward. Through the same Christ our Lord. Jesus Christ finds means to console a soul that remains with a recollected spirit before the Most Blessed Sacrament, far beyond what the world can do with all its feasts and pastimes. Oh, how sweet a joy it is to remain with faith and tender devotion before an altar, and converse familiarly with Jesus Christ, who is there for the express purpose of listening to and graciously hearing those who pray to him; to ask his pardon for the displeasures which we have caused him; to represent our wants to him, as a friend does to a friend in whom he places all his confidence; to ask him for his graces, for his love, and for his kingdom; but above all, oh, what a heaven it is there to remain making acts of love towards that Lord who is on the very altar praying to the Eternal Father for us, and is there burning with love for us. Indeed that love it is which detains him there, thus hidden and unknown, and where he is even despised by ungrateful souls! But why should we say more? "Taste and see." Nothing can compare with the ardor and power of a soul as it seeks its Beloved and longs for Him; it finds its happiness in longing for Him and seeking Him. The God of the Eucharist conceals Himself in order to be desired, veils Himself in order to become an object of contemplation; He wraps Himself in mystery in order to spur on and perfect the soul's love. The Holy Eucharist thus becomes food ever new, ever powerful over the heart it inflames. Something akin to what happens in heaven then takes place: a hunger and thirst for God ever keen and ever satisfied; the loving soul penetrates the depths of divine love and never ceases discovering new riches therein; Jesus manifests Himself by degrees to the soul to draw it ever more purely and strongly to Himself,"
"The devotion which leads the faithful to visit the Blessed Sacrament draws them into an ever deeper participation of the Paschal Mystery. It leads them to respond gratefully to the gift of him who through his humanity constantly pours divine life into the members of his body. Dwelling with Christ our Lord, they enjoy his intimate friendship and pour out their hearts before him for themselves and for their dear ones, and pray for the peace and salvation of the world. They offer their entire lives with Christ to the Father in the Holy Spirit, and receive in this wonderful exchange an increase in faith, hope and charity. Thus they nourish those right dispositions which enable them with all true devotion to celebrate the memorial of the Lord and to receive frequently the bread given to us by the Father,"
"Devotion to the Blessed Sacrament is the queen of all devotions. It is the central devotion of the Church. All others gather round it, and group themselves there as satellites; for others celebrate his mysteries; this is Himself. It is the universal devotion. No one can be without it, in order to be a Christian. How can a man be a Christian who does not worship the living Presence of Christ?,"
"I place myself in the presence of Him, in whose Incarnate Presence I am before, I place myself there. I praise, bless, and give myself wholly to Him, who is the true Bread of my soul, and my everlasting joy,"
The 'yes' of Mary gave us the Holy Eucharist, as the body of Jesus was formed from the Immaculate Heart of His Mother, from whose flesh Jesus took the flesh He gives us in the Blessed Sacrament. The joy of the Annunciation continues to sound in our ears today, because the good news of the Gospel is God's love for us, "The Virgin shall give birth to a Son and they shall call Him Emmanuel, a name which means 'GOD IS WITH US' This is our joy today! Jesus chose the name 'Emmanuel' BECAUSE OF HIS INFINITE DESIRE TO DWELL WITH US ALWAYS IN THIS MOST BLESSED SACRAMENT, as absolute proof of HIS EVERLASTING LOVE and CONSTANT AFFECTION for each of us. He came on earth from heaven for suffering man, becoming incarnate in a virgin's womb from which he came forth as man; he took on himself the sufferings of suffering man through a body capable of suffering, and put to an end the sufferings of the flesh, and through his spirit incapable of death he became the death of death which is destructive of man. For led like a lamb, and slaughtered like a sheep, he ransomed us from the slavery of the world of Egypt, and loosened us from the slavery of the devil as from the hand of Pharaoh, and sealed our souls with his own spirit, and our bodily members with his own blood. This is the one who covered death with the garment of reproach, who put the devil in mourning garb as Moses did Pharaoh. This is he who smote lawlessness and rendered injustice bereft of children as Moses did Egypt. This is the one who rescued us from slavery to liberty, from darkness to light, from tyranny to the kingdom of eternity (who made us a new priesthood, a people chosen, eternal). This is he who is the Passover of our salvation; this is he who suffered many things in many men. This is he who in Abel was slaughtered, in Jacob was exiled, in Joseph was sold, in Moses was exposed, in the lamb was immolated, in David was persecuted, in the prophets was maltreated. This is he in whom the virgin was made incarnate, on the cross was suspended, in the earth was buried, from the dead was resurrected, to the highest of heaven was lifted up. This is the lamb without voice, this is the lamb slaughtered, this is the lamb born of the fair ewe this is he who was taken from the flock, and dragged to immolation, and at evening slaughtered, and by night buried. This is he who on the cross was not broken, and in the earth did not decay, but from the dead rose again, and raised up man from the depths of the tomb. "At the Last Supper, on the night he was betrayed, our Savior instituted the Eucharistic sacrifice of his Body and Blood. This he did in order to perpetuate the sacrifice of the Cross throughout the ages until he should come again, and so to entrust to his beloved Spouse, the Church, a memorial of his death and resurrection: a sacrament of love, a sign of unity, a bond of charity, a paschal banquet in which Christ is consumed, the mind is filled with grace, and a pledge for future glory is given to us,"
and believes in Him shall have eternal life. to all who come into His presence. that we may share also in the glory of Your resurrection. "ALL I WANT IS TO KNOW CHRIST JESUS..."
- from "Come to Me"
"The voice of my Beloved knocking: Open to Me, My sister, My love, My dove, My undefiled" (Song 5:2). Such are the words which Jesus in the Blessed Sacrament speaks to those who love and desire him. Open to me, he says, O soul, thy heart, and there I will come to unite myself to thee; so that, being one with me, thou mayst become my sister by resemblance, my friend by participation in my riches, my dove by the gift of simplicity, my undefiled by the gift of purity, which I shall communicate to thee. And then he goes on to say, "Open to me, for my head is full of dew and my locks the drops of the night." As if he said: Consider, my beloved, that I have waited for thee all the night of the bad life thou has led in the midst of darkness and error. Behold, now, instead of bringing scourges to chastise thee, I come in the Blessed Sacrament, with my hair full of heavenly dew, to extinguish in thee all impure desires towards creatures, and to kindle in thee the happy fire of my love. Come, then, O my beloved Jesus, and work in me what Thou wilt. "This worship, given therefore to the Trinity of the Father and of the Son and of the Holy Spirit, above all accompanies and permeates the celebration of the Eucharistic liturgy. But it must fill our churches also outside the timetable of Masses. Indeed, since the Eucharistic mystery was instituted out of love, and makes Christ sacramentally present, it is worthy of thanksgiving and worship. And this worship must be prominent in all our encounters with the Blessed Sacrament, both when we visit our churches and when the sacred species are taken to the sick and administered to them,"
our Lord Jesus Christ on the altar. This body burns the thorns of sin. This body gives light to the souls of all believers. we have made with our God. on the day of requital. the mystery of your grace? "O Jesus! on this day, you have fulfilled all my desires. To sacrifice myself in silence, to wait for Heaven in peace. And like a seraphim, Lord, I shall love You." "Canticle of a Soul Having Found the Place of Its Rest!..." When Christ manifested Himself to Margaret Mary, and declared to her the infinitude of His love, at the same time, in the manner of a mourner, He complained that so many and such great injuries were done to Him by ungrateful men  and we would that these words in which He made this complaint were fixed in the minds of the faithful, and were never blotted out by oblivion: "Behold this Heart"  He said  "which has loved men so much and has loaded them with all benefits, and for this boundless love has had no return but neglect, and contumely, and this often from those who were bound by a debt and duty of more special love." In order that these faults might be washed away, He then recommended several things to be done, and in particular the following as most pleasing to Himself, namely that men should approach the Altar with this purpose of expiating sin, making what is called a Communion of Reparation  and that they should likewise make expiatory supplications and prayers, prolonged for a whole hour  which is rightly called the "Holy Hour." These pious exercises have been approved by the Church and have also been enriched with copious indulgences. You are my strength, O sturdy anchor! You are the weak heart's shield and protection. And your soul is beyond all comparison. Your beauty has delighted the eye of the Thrice-Holy One. And for nine months lay hidden in a Virgin's Heart. Your heart was Jesus' first tabernacle on earth. Behold, for you I have established a throne of mercy on earth  the tabernacle  and from this throne I desire to enter into your heart. I am not surrounded by a retinue of guards. You can come to me at any moment, at any time; I want to speak to you and I desire to grant you grace. ...You left us Yourself in the Sacrament of the Altar, and You opened wide Your mercy to us. There is no misery that could exhaust You; You have called us all to this fountain of love, to this spring of God's compassion. Here is the tabernacle of Your mercy, here is the remedy for all our ills. To You, O living spring of mercy, all souls are drawn; some like deer, thirsting for Your love, others to wash the wound of their sins and still others, exhausted by life, to draw strength. O Jesus, concealed in the Blessed Sacrament of the Altar, my only love and mercy, I commend to You all the needs of my body and soul. You can help me, because You are Mercy itself. In You lies all my hope. And streams of Blood and Water gushed forth from Your Heart. Here souls receive consolation and refreshment. "Come, blessed soul! enter the kingdom prepared for you before the foundation of the world. It is Himself. If we saw Him eat fish and honeycomb by the lake, we could not be more sure. O how He is drawing our soul to Him! Sweet compulsion, which makes the will more free than ever! beautiful constraint, that emancipates by its captivity! whence come these attractions that are now drawing us to themselves? They come from the altar-throne, and from the Human Soul and Body that are there. I will draw them, says He in the monstrance, with cords of Adam, the bands of love. "Ah Lord Jesus! we spoke of Thee as in heaven and lo! Thou art here, and all heaven is with Thee here. O Blessed Sacrament! Thou makest all life now like one continued walk to Emmaus. Our hearts burn, and it is not that we know not why, but that we will not remember why. "I was like a foster-father to Ephraim: I carried them in my arms; and they knew not that I healed them." But how long shall these things be. O that our hearts were modelled upon Thee as creation was, and crowned by Thee as creation is, and that since thou hast our nature, we might participate more abundantly in Thy grace, and that as Thou wilt lead us to glory hereafter, so now Thy hidden Sacramental presence might already be our glory here!"